Floppy disks, both 8 inch and 3 1/2 inch size, were canvases for some of my first works of “art”. I use that term loosely because when I was 8 years old, “art” to me was … well drawing ninjas and wizards on EVERYTHING. I used these disks to store data for mostly pictures (i think one of these disks could hold 3 of them), as well as shareware games. I ended up using these disks even up to the year 1999, when I purchased my first digital camera. It was a ONE megapixel camera… it was the size of 2 bricks, and had a massive strap to put around my neck because it was so incredibly heavy. This was before the time of SD cards… so guess what this camera used to capture pictures? Yes folks, this camera used 3 1/2 floppy disks. .. and because I TOOK PICTURES OF EVERYTHING… .. I had ALOT of these floppy disks lying around. I still, to this day, have these around, because.. well I’m an art hoarder. So looking fondly (and awkwardly) back at my youth in the 80’s, I came up with this piece as 3 1/2 floppy disks (aka: hard disks or diskettes) were intrinsically a part of my life and my friends lives back then. This is called “Dataworld.exe” and it is the 9th in the “Child of the 80’s series, and 68th in the collection. Inside the face of Mickey are actual windows DOS coding that revolve around basic data folders and listings. 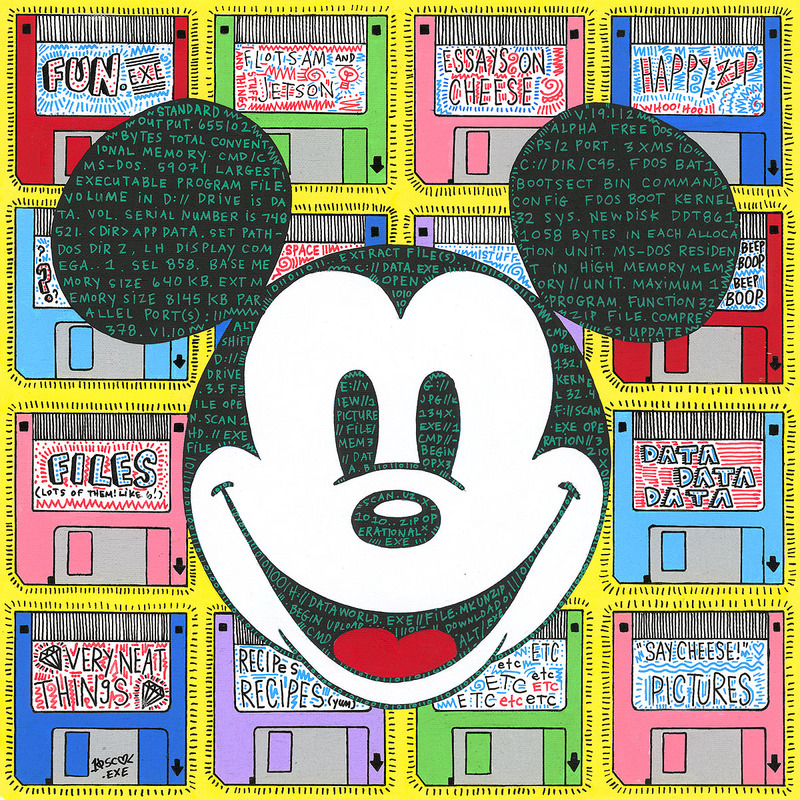 The drawings on these floppy disks are kid like and playful, and point to some of the core Disney characters and what they may have drawn on them, if they too were part of the extravagant nerd culture of the 80’s like I was. When experimenting with No. 48 “Pink Bermuda”, I focused on George J. Sowden’s “Acapulco Clock, it opened up a vast interest of not only him, but the “Memphis Milano” collective he was a part of. Ettore Sottsass, the founder of Memphis Milano, shaped the way the 1980’s were worn and lived in. His style impacted the world, and earthquaked a fashion trend that saturated the planet in controlled chaos. 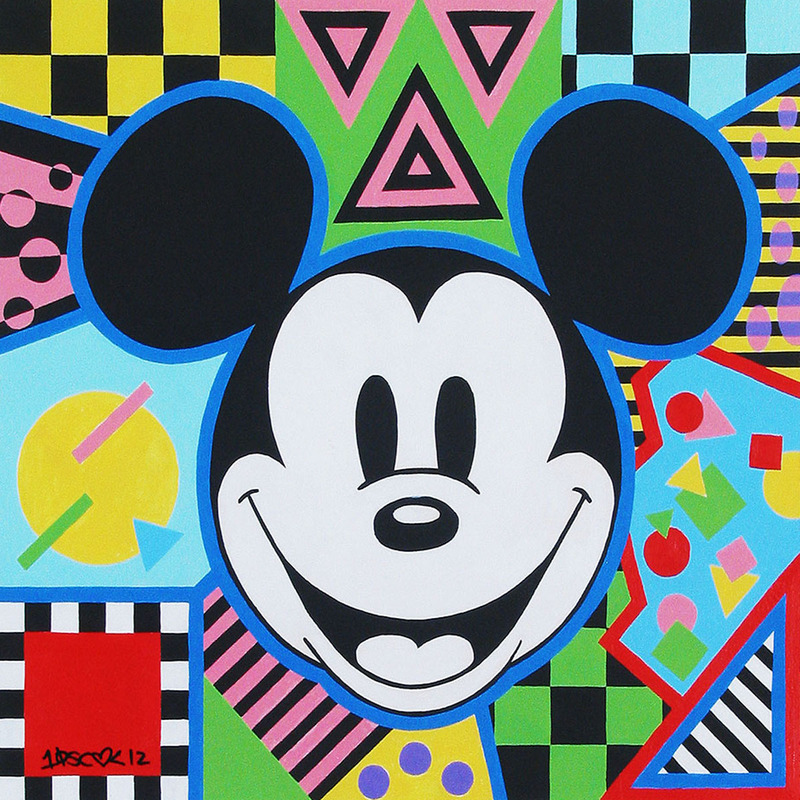 This piece, entitled “Memphis Milano Mickey’, was inspired by the French designer Nathalie Du Pasquier, who was the cutting edge force behind the aesthetics of the 1980’s. In this painting, I focused on my strength in geometric shapes fashioned against mismatched patterns of pink, green, aqua blue, and yellow. 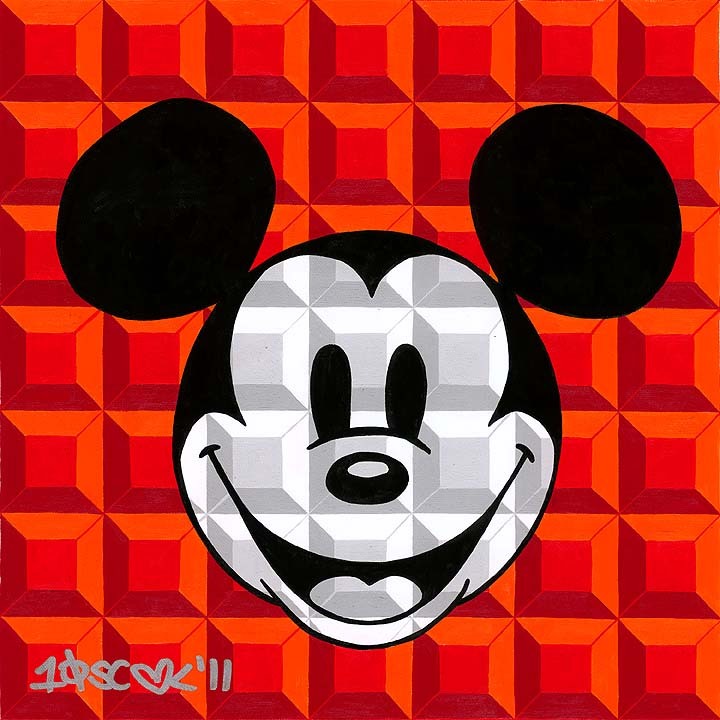 Mickey and the achromatic scales here are the anchors to the color storm, fixating himself as a object of safety and sanity in a world that, at any minute, could spin out of control into oblivion. This is the 8th piece of the “Children of the 1980’s Series” and the 56th of the TENxTENxTEN collection. At first my attention to the “Children of the 1980’s” series focused purely on what resonated nostalgically to me, which was video games. After 8 bit Mickey and the arcade versions thereafter, my brain strained to think about the 80’s, its aesthetic, and how it translated into this series. After “Pink Bermuda”, a piece based in the “Geometric Spectrum” series. my head erupted into many ideas focusing on the fashions inspired from the “Memphis Milano” collective. This piece, entitled “1987” is about 1980’s ready to wear fashion, and more specifically, clothes that I wore back in my days in Elementary and Middle School in Georgia. I picked patterns from my clothes from “Chip and Pepper”, “Bugle Boy”, “Ocean Pacific”, and the MANY MANY combinations from my “Jams” shirt/shorts combos. The great part about this era was that you could be colorblind, and any combination, whether it matched or contrasted, made a eyesore of a fashion statement that worked. This piece revolves around multicolored ‘racetrack checker flag’ designs encased in explosions around geometric shapes that float in designated controlled fields. Overall this conveys the ultimate design of the 1980’s within this series. Much like Nintendo was the best friend/babysitter in my childhood, the Arcade was the first real adaptation into a social circle beyond my school microcosm. In the southern suburbia that I grew up in, there was one major arcade in town in a semi thriving strip mall called “Merchants Walk”. It was tucked in at the end of the complex, next to an alleyway and a shabby theatre called “Cineplex Odeon”. Pockets drenched in quarters from my allowance, I cowboy walked clinking to the arcade thrilled to lose my mind for an hour. It was almost as if I was going to play slots, but rather than be excited about winning potential money, it was more the thrill of getting out of my head. My world was centered around video games, and it all came down to disassociating my state of reality. Even now, in my mid thirties, when I’m having a terrible day and painting or hiking won’t help. I’ll turn on my video game system and spend an hour in a reality that is beyond my own. It kind of weeds out the pond scum junk like thoughts that plague me redundantly, and I suppose its a coping mechanism that I learned from these systems. In regards to this piece, it is in homage to the 80’s and 90’s coin operated arcade machines. I researched the 8bit dollar sign, and plastered its pattern across the grid. I believe on the back of this canvas is the drafting of the dollar sign. While it can be interpreted that this painting has a slight angle at consumerism, that is certainly not this intent. 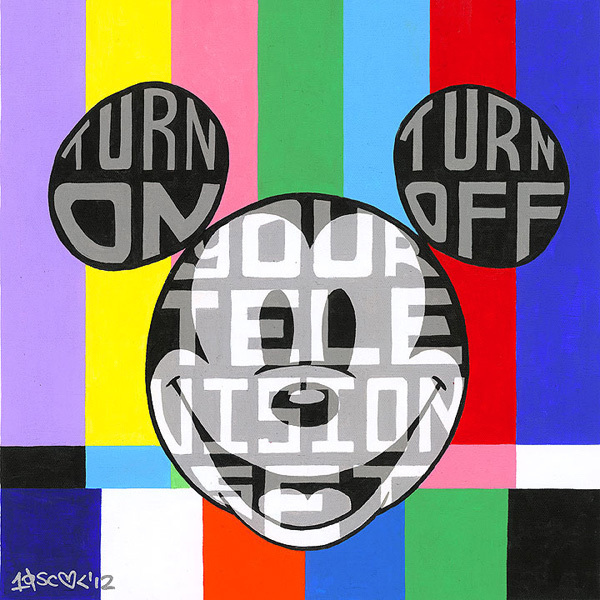 Mickey is in greyscale, which pops off the multicolored .vs. black pattern. 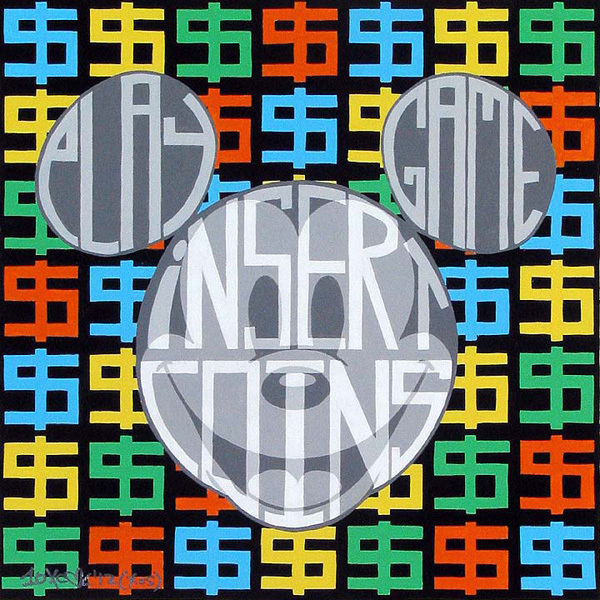 This gives an impression that Mickey, himself, is the console, and therefore the gateway from everyday reality to the arcade world of imaginative reveries (as if you pressed the actual mickey image, it would start the game). This is about the portal from everyday reality into an 8bit world of objective consciousness through the means of an arcade system. Insert a coin, and press start, and your world turns into side scrolling active world that without knowing it, calms the mind, and pushes you into a satiated state for the hungry dreamer. Nostalgia is the boomerang that connects our heart to our past. Writers begin to touch the surface of their craft with the cliche but resonant quote from their instructors “Write what you know, and the rest will come”. Generally the same principle applies to painters, in that we paint what we know, and as we delve into our reasons for creating in the first place, we get to the very epicenter of our imaginative cortex, the ‘heart center’ that guides us outwards onto the blank slate. I have, for the most part, had to relearn how to paint all over again due to some incredibly dark times, and in that process I believe that most of my work has been therapy… relearning how to paint straight lines… relearning how to actually use my hands physically…and secondly relearning to use my brain to reconnect to not just the world, but internally. Nostalgia was the key factor in going deeper into what I was capable of. I had to go back to my brief creative blip with No. 3 through No. 6 in the 8bit series, and really focus on where I got that idea from. So I closed my eyes again, like I had done in San Francisco when I heard Nintendo music as an inspiration, and this time the sound of 80’s television came to me. Specifically the sound of when the television programs were over. It was that monotone synthetic sound that came on past the programs, past the national anthem on the organ, past the images of an eagle picking at himself and an awkward shot of a flag blowing semi gloriously, semi lonesome like in the wind. It was that pattern of blocks, some cool and some warm, all fit in certain ways strangely. It was the picture and sound of wild imaginative hyperactive nights as a child where I couldn’t go to sleep because I was so wound up from the day, that I’d sojourn to the basement to watch TV until I’d fall asleep. Television was the fuel to my imaginative fire, and my imagination was my shield against the often brutal aspects of my childhood. I had two great strengths, the ability to daydream to where I didn’t even remotely exist in my plane, and the ability to socialize. These two strengths never connected. Either I was completely withdrawn into my world, or I was pushing that bit of me away to adapt to my social microcosm of a southern school system. It was literally like a switch. Turn on the television set, my imagination, and I’m creating portraits and maze like patterns all over the place, yet withdrawing from social interacting. Turn off the television set, and I’d shut down my daydreaming and creativity patterns, and yet be socially thriving and happy. Mind you, these dissipated when I ventured into high school, and my emotions became, at best, intertwined into my art and my social life… It wasn’t until a few years ago, when I lost everything due to some tragic events, where I turned the clock backwards to that awkward idealism of a dichotomous state of self. At best I have these flittering moments of social mediocrity, however my head is backed up from many years of not being able to think clearly or imagine clearly, that I’m literally gushing out artistic expression through my fingers like a out of control geyser. I am learning to harness both these aspects of my life and merge them into my everyday patterns of living. But for the meantime I can only say that I’m aware of both. This piece is about that idea of two worlds separated, the ability to turn off and turn on, and understanding that while we may have the switch, life has the remote control. I’m failing on remembering what hues I did for this, but initially they were supposed to reflect “Mickey in Sunset Pyramids”, No. 4. For some reason I cannot remember why I didn’t use the same code for this. Regardless, this was done the night before my last day in San Francisco in 2011. Nintendo was an incredible playing factor in my youth. It was my babysitter, my channel for my frustrations, and my greatest source of entertainment. You could almost say to this slightly awkward, mildly chubby, flamboyant ginger growing up in the nondescript suburbia in Georgia, that Nintendo was my best friend. Being that had an incredibly vivid imagination (certainly a tool for my turbulent childhood), this little box blurted out a mosaic of dreams into the television set… and showed me adventures that I could not come up with on my own. This is for the series “Children of the 1980’s”. 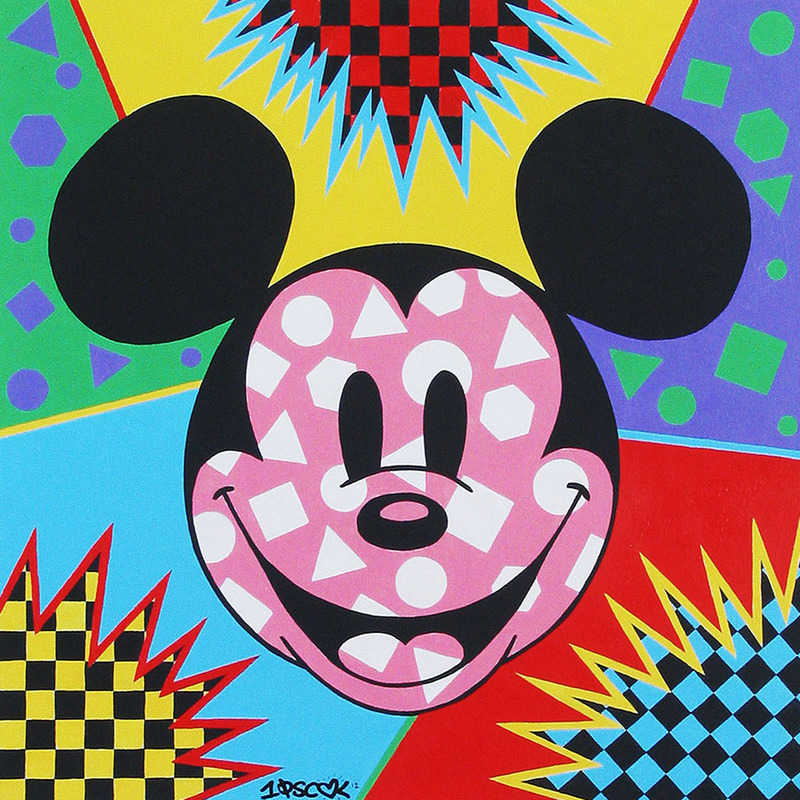 In February, Disney Fine Art created an amazing serigraph run on these which range in Ultramarine Blue, Vibrant Red, Spring Green, and Teal, which are all personally and numbered by me. I’m not sure they are released yet until my solo show up at Art Collectibles in Chicago on April 21st, 2012.